How can I use the interpolating functions I constructed for the four nodes of a quadrilateral to use as parameters to smoothly paint the edges of the quadrilateral when 4 different color values are given on the four nodes already. how do I use these as parameters to do it? do I have to do it piecewise or do I have to use the polynomial: the sum of the product of the interpolating function with their respective data point? the A, B, C, D is in the order of the list in localCoordinates; can Manipulate also be incorporated for changing the values. I really do not know ho to do it so I want to find help. Not the answer you're looking for? Browse other questions tagged graphics interpolation or ask your own question. 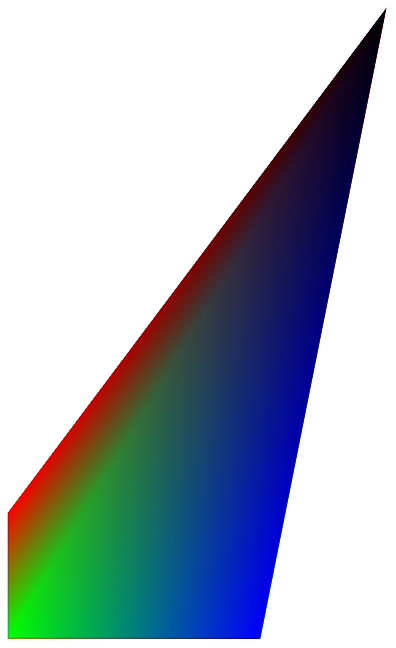 how to use interpolating functions to smoothly paint a polygon?